Fabric structures covering anything (farmer’s market, sports, retail, and music performance) can be bought, sold or rented and have more value than something without a cover. 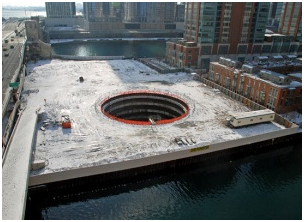 The Chicago Spire, Santiago Calatrava’s tower design that would have been the tallest building in the United States, had it been built, is a now a beautiful hole in the ground. The existing geometry and foundation provide a perfect base for a tension fabric structure. The structure could be a series of high and low hypars that could collect water and provide shade for its visitors. Frei Otto’s Tanzbrunnen Fabric Roof in Cologne, Germany comes to mind. The design value of fabric structures is limitless. ← It looks blue, but it’s green. I wonder if you could tension fabric over this with springs and make the world’s largest trampoline instead?